Hillary Clinton, the Democratic presidential candidate and former secretary of state, will deliver a major speech on economic policy on Monday, laying out in more detail her diagnosis of went wrong with the economy and, in broad strokes, how she will approach fixing it, the campaign says. She will make clear, according to a campaign official, that she doesn’t believe wage stagnation and growing inequality are simply facts that we have to live with, caused by trends outside our control. Rather, she will say that the U.S. has the power to change these patterns if we make the right policy choices. Here are seven ways to understand why Clinton is making the case. 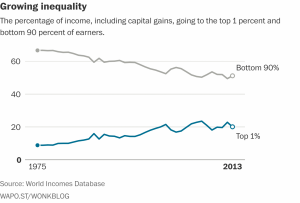 1) Clinton’s top goal is raising median incomes. (2) She believes policy can help raise worker pay and reduce inequality. (3) In particular, she is looking to boost women’s pay. (4) And Clinton is looking to make sure more women are in the workforce. (5) Clinton believes the federal minimum wage should be lifted. (6) And she believes tax policy changes that favor the wealthy are misguided. (7) She also wants to make corporations, particularly on Wall Street, more focused on long-term returns.